Welcome to The Officers' Mess of The Canadian Scottish Regiment. The mess is located upstairs in Room 313 of The Bay Street Armoury. Join the Mess as an Associate member! Associate membership has it's benefits! Interested in becoming an associate member of the Officer's mess? The original purpose of the officers’ mess was twofold: to provide a home for the bachelor officers who lived in quarters and to be the social centre of all of the officers of the unit. That purpose has evolved over the years but it continues to be used for building of "esprit de corps" and camaraderie, and to provide entertainment, goods, services, and amenities to all of its members. The Mess has a vital role in fostering the traditions of the Canadian Army and in particular the customs and traditions of the Canadian Scottish Regiment. Scottish customs will be used and practiced in our Mess wherever appropriate. 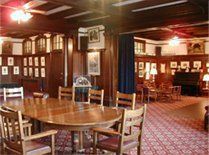 The Canadian Scottish Regiment Officers’ Mess was created to serve as an abiding memorial to the long, varied and brilliant careers and services of the Regiment’s officers since 1912. Traditionally the army officer’s life centered around his regimental mess when he was not on duty. Although the mess often provided the officer a meal and a bed, it was more often a club and notable social establishment, where he could socialize on a regular basis with his peers and unwind from the stress of the campaign. Today, it is where the officers get to know and trust one another beyond the strict professional interaction of their primary duties and can establish the same cohesion throughout the command structure. 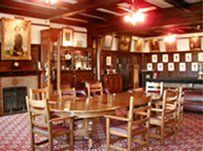 Combining spirit, camaraderie and nostalgia of the old Canadian Scottish Regiment’s Officers’ Mess, we preserve the memory of the past and provide a venue to discuss the future. It is intended that suitable high standards of dress be maintained. Accordingly, the following regulations concerning the standards of uniform and civilian dress and the occasions for their wear are to be adhered to by all Members and their guests. The normal order of civilian attire is smart casual unless authorized by the PMC. On occasions when formal dress is the standard, the wearing of mess kits is permitted for both serving and retired officers. Retired officers may wear their miniature medals and decorations with civilian formal dress. Service dress-of-the-day, slacks (jeans or shorts are not acceptable) and open neck shirt with collar/golf shirt with collar, with or without sweater or sports jacket/blazer. Service dress-of-the-day or dress/skirt/slacks as appropriate (jeans or shorts are not acceptable). Service dress-of-the-day or dress/skirt/slacks/shorts as appropriate. Sports gear or other relaxed dress may be authorized by the PMC for specific occasions. Smart casual dress is authorized throughout the periods that Winter/Summer dress regulations are in effect, except as noted above. Dress for specific functions, other than smart casual dress, will be promulgated in the calendar or the function flyer. Outerwear, backpacks, and headdress are to be removed and placed in the cloak room upon entrance into the mess. With all orders of dress, clean and presentable footwear is required. c. personnel for whom wearing headgear is mandatory for religious reasons. All Canadian Forces personnel, Regular and Reserve, must belong to a mess, and are termed ordinary members of their particular mess. The serving officers of the Regiment are pleased to be able to offer from time to time, the privilege of associate membership to members of the community. Our mess has many associate members who are either retired military officers or who have, through their association with the mess, expressed an interest in belonging. Expressions of interest may be sent to any serving officer of the Regiment or by contacting the President of the Mess Committee (contact info below). Although on Federal property, messes have been ordered by the Government of Canada to comply with the liquor laws of the province. As such, we are licensed through the BCLCLB and comply with all legal requirements. Since we may have members who are under the legal drinking age in the Province of BC and since they are required to belong to a mess, our license specifically stipulates that those members may be present in the mess, although they are not to be served alcoholic beverages. Our bar staff are trained through the province with the “Serving It Right” qualification and all issues that cannot be dealt with by them are referred to the President of the Mess Committee. Our mess is usually open only on training nights, event nights and special occasions as directed and approved by the Commanding Officer. Invitations are normally sent out for events, but on occasions such as Remembrance Day, the mess is open for all visitors. Serving officers who belong to other messes are more than welcome to drop in at anytime that the mess is open. Serving personnel who are not commissioned officers normally do not enter the officers’ mess, but these restrictions may be waived on designated occasions, when the messes are "opened" to all personnel, regardless of rank. These occasions will be approved by either the Commanding Officer or the President of the Mess Committee and will be promulgated in the unit and also on this web site. The Canadian Scottish Regiment’s Officers’ Mess boasts one of the best collections of whiskeys, particularly single malt scotches, in the region. Those who wish to “inspect” our selection and who are not members of the mess are invited to make a request to the President of the Mess Committee in order to avail yourself of an opportunity. Hanging beside the bar inside the mess is a bell. The ringing of the bell indicates that the ringer is offering to buy a round of drinks for all present. There are many reasons to consider ringing the bell and one of the most common is to celebrate the ringer's promotion. By custom, an inadvertent ringing of the bell, whether by accident or trickery, will be considered a similar offer. Upon crossing the threshold from the cloakroom into the mess proper, it is considered appropriate for the serving officers to stop and adopt the position of “attention” for a second or two in order to mark their respect for the officers present. Although not required for associate members, it has been noticed that retired officers tend to continue the practise. Should a member or guest have occasion to depart the mess before the Commanding Officer, he or she will normally bid good night to the CO (or in his absence, the PMC or the senior officer remaining). This mark of respect is common within Regimental messes across the Canadian Army and is one that continues to be practised in ours. Along two walls, we have either paintings or photographs of our former Commanding Officers. In the cases of those who have passed away, the mess has obtained their miniature medals from their families and have mounted them along one wall. Our mess has decorations that reflect different parts of our Regimental history and any serving officer should be able to describe their significance to visitors upon questioning. Please feel free to pose skill-testing questions should you find yourself in our mess. In display cases and on flat surfaces throughout the mess, we have a collection of silver decorations that were donated by serving members throughout our history. There are also trophies (some no longer offered in competition) that we have “won” over the years. We are pleased to display them for all members and visitors to the mess. Throughout the mess one may find other items that have been donated throughout the years to the mess. These items include, but are not limited to: a chess game, a liar’s dice box, a piano, and the ram’s head. Please feel free to explore our mess and discover other items that have been donated over the years. On either side of the fireplace, our colours are encased in lighted cabinets. On the left as you look at them, is the Queen’s Colour and on the right is the Regimental Colour. In the Canadian Army, the colours are retained in the Officers’ Mess when not on display in another location or on parade. The colours are essentially consecrated flags; the Queen’s Colour taking the form of a Canadian Flag with our Regimental Badge superimposed upon it and the Regimental Colour being of blue background, Regimental Badge in the centre and surrounded by many (not all) of the battle honours approved for our Regiment. The battle honours are named battles in scroll-work renditions and sewn upon the colour. The content and form of both colours are approved by the College of Heralds and by the Queen of Canada. At all times, when out of the mess, the colours are to be “guarded” by colour officers and a colour party of armed NCOs. The tradition of colours can be traced back to Roman times when the standard (later replaced by our current tradition of colours) was the rallying point for members of the unit so that during the violent and often confusing clashes that occurred in battle, a soldier could always find his unit, rally behind the colours and continue to fight. Today, it is customary for the colours to be displayed in the mess during formal dinners. The Regimental Sergeant Major may also request that the colours be present at formal dinners in the Warrant Officers’ and Sergeants’ Mess. All due ceremony is accorded to the movement and placement of the colours when removed from the cases in the officers’ mess. Colours may also be ordered onto parade on appropriate ceremonial occasions as a symbol of past times when they were the rallying point for the Regiment.